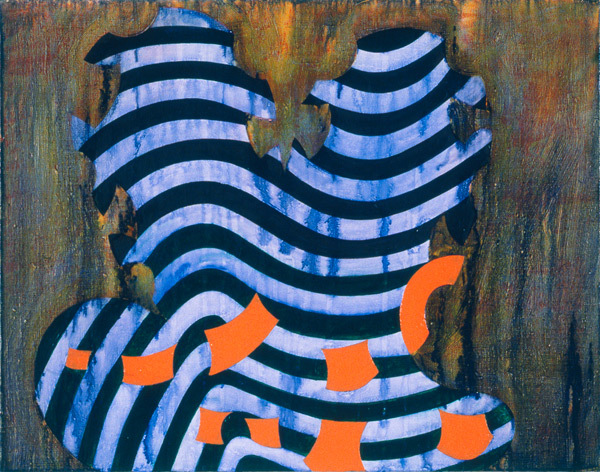 Thomas Nozkowski, Untitled (7-72), 1995, Oil on linen on panel, 40.6 x 50.8 cm, Max Protecht Collection, © Thomas Nozkowski / Courtesy PaceWildenstein, New York. Some people have moderation built in, like a personality module fully loaded from birth. Those are the lucky souls who can sit in front of a bowl of chocolate covered raisins and just take one. I’m not that person. I have a proclivity for excess. Curiosities, ideas, themes come in, take over all the airwaves and monopolize my thinking for any given period of time. This post is more about my newfound fascination with the works and the words of Thomas Nozkowski (which began with yesterday’s post.) The more I read the more sure I am he is talking to me, for me, with me, in me. Isn’t the voice of geezerdom, with its war stories and self-regard, the last thing a young artist wants to hear? Who can stand one more story about My First Loft in SoHo, you know, the one that rented for $100 a month? Or how about The Day I Met Duchamp, How I Stretch My Canvases, The Beautiful Blonde on the Train to Paris? Isn’t it high time the old folks shuffled off and room was made for the new ideas and language of the young? What can I possibly say that might be of interest to a cool kid like you? My generation, well, we are just in your way — and we know it, too. The reality, as usual, is all mixed up. It is good to be reminded of the commonalities of our experience, that we have brothers and sisters — even parents and children — and that we are not alone; still, it’s a bore to be buttonholed by some garrulous old uncle who really just wants to brag about his own successes. For myself I prefer careers that last thirty years to those that last thirty months, but there is no reason to believe there is always more integrity to one pattern than the other. Let’s face it, it’s not like this is something that is under our control. Not really. Much of the time, if an artist is any good, she is developing a way of understanding the spirit and the stuff of the world that is bound to go beyond the way just about everyone else sees and thinks about it, at least for a while. We are not ignored for malicious reasons, alas. Recognition, when it comes, sometimes can seem like a misunderstanding. The real life of the artist is solitary. The central fact of artists’ lives — the part that non-artists never seem to quite understand — is the loneliness of the studio. Before our runs are over we will have spent more time –thousands upon thousands of hours — alone, just staring at these things we make. This part of our experience must be factored in to every idea about artists’ lives if you want to understand them. More artists stop working because of this loneliness than for any other reason. If there is one essential survival skill that you must learn, it is how to sustain yourself and your work over the years. There is really only one way to do this, and that is by loving what you do, being fascinated by your work, and by being obsessed with making art. You will get in trouble if you need the approval of others to keep your work moving forward. After all these years, the one essential element in my practice, the one thing I am sure of is that I need to be interested in and happy about what I am doing in the studio. This is great, Deborah! Keep ’em coming. He says it all. So glad my obsession works for you too Nancy. His tone is spot on IMHO. Thanks for connecting. Thank you Deborah – this rings so true !! ytou have a way of touching my soul. Marcia, we have had this conversation but I love the way he phrases these concepts. So articulate, so self-effacing. Our kind of guy. That second quote also perfectly describes the writer’s life. It’s true. All the professions that require solitude–art, composing, poetry/writing– are so different from the highly collaborative nature of theater and music performance. I agree with Nozkowski, that loneliness factor is probably the major reason people stop making. Stephanie, so kind what you have written. Thank you. But it’s true, we are a mind meld on this one. Thanks for your comment. great advice! I completely agree as someone who had a 30 year worldly career and has one no longer, but is sustained by a love of working. Thanks Altoon. From where I sit it looks like you have blended together so many of the things you love. You are a great example of someone who is living her life on her own terms. Very inspiring.